The term baseload gets thrown around frequently but seldom is associated with a base, or minimum, load. It occurs to me the level of knowledge in discussions on electricity supply could benefit from reviewing the level of total electricity that would be met by a mythical generator running throughout at a the year at the minimum system demand. The results are not surprising,but the current level of discourse indicates the results are not intuitive. I’ve revisited hourly load data I’ve collected over the past year for two provinces and British Columbia (bce … or BC). Each data set measures “load”, or demand, differently, but the particulars are not important for this simple review. For each province’s data set, I’ve queried the minimum annual load along with the average. Upon reflection it’s obvious that the minimum load divided by the average load produced the percentage of annual supply that could come from the steady production of the minimum load. Differences between years are minimal, but the difference between Alberta and the other 2 provinces is significant. Alberta’s flat load profile means 80% of annual generation could usually be met by consistent supply at the base load level. “Alberta Internal Load”, or AIL, is the statistic used, and it includes behind-the-fence generation which is large due to extensive cogeneration, particularly from oil sands operations. Large industrial loads tend to be far more consistent than, particularly, residential demands. 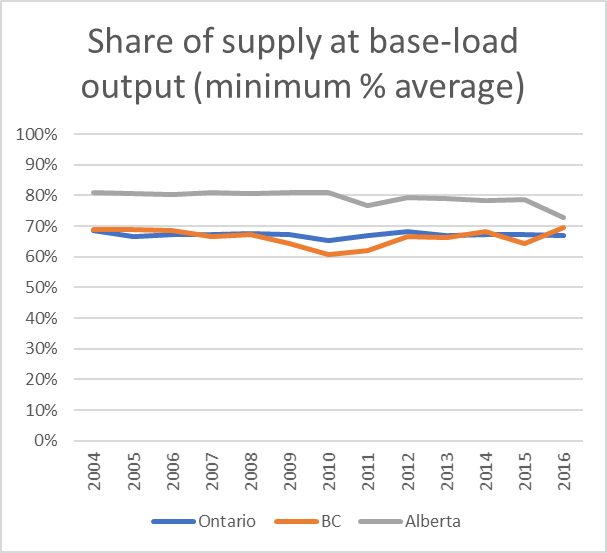 In Ontario and BC the reported loads, which omit behind-the-fence generation, indicate over 2/3rd of supply requirements would be met by output at the base load level. For reasons I’ll return to in discussing implication of this base load supply level review, I ran some figures estimating how much usable supply would come from increasing the base supply level to 10% above the annual base load level, and with base supply 20% above base load. 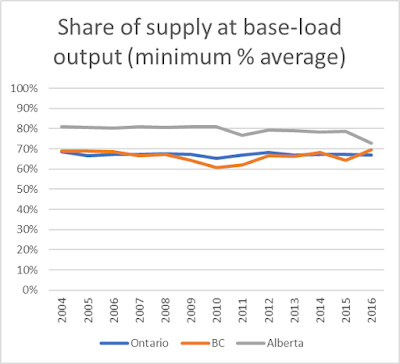 The share of annual supply coming from the increased base supply levels vary because I’ve measured the excess - when supply is above the minimum load curtailment must occur, but it occurs at much different levels in the 3 jurisdictions. Curtailment is high in BC with baseload supply increased even 10%,but remains low in Ontario and Alberta. Increasing base supply to 20% above the annual minimum load, curtailment on the incremental supply rises to more significant levels in Alberta. Ontario receives about 80% of its demand requirements in this scenario with base supply 20% above the annual demand low, with curtailment of approximately 3% of the output from the additional 20% baseload generation. This examination does not state what baseload generators should be, or even the appropriate capacity. Baseload generators do not operate at 100%, and that is often a positive as the facilities can be shut down for required work during lower demand shoulder seasons. This examination does show relatively few sites can provide the bulk of a province’s electricity, and if those sites have no, or low, emissions other jurisdictions could replicate the low emissions’ intensity of Ontario (and France, and Sweden…). "We looked at the variability of solar and wind energy over both time and space and compared that to U.S. electricity demand," Davis said. "What we found is that we could reliably get around 80 percent of our electricity from these sources by building either a continental-scale transmission network or facilities that could store 12 hours' worth of the nation's electricity demand." The researchers said that such expansion of transmission or storage capabilities would mean very substantial -- but not inconceivable -- investments. They estimated that the cost of the new transmission lines required, for example, could be hundreds of billions of dollars. In comparison, storing that much electricity with today's cheapest batteries would likely cost more than a trillion dollars, although prices are falling. While getting 80% of supply from baseload mode generators is a known possibility, the practicality of producing a majority of supply with vRES remains speculative: transmission projects are proving difficult to get built, and curtailment would need to far exceed the levels seen in Ontario to justify the round-trip efficiency losses of battery systems, along with the trillion dollar cost.